6 May 2010: I have found a new way to make scrambled eggs that is guaranteed to be perfect. No more watery or runny scrambled eggs! Come find out more! There are those days when I woke up almost near noon and faced such a dilemma – too late to make breakfast and too early to prepare lunch. I would probably starve to death (okay, maybe half-death) while preparing a proper lunch. That’s when I crave for some express food which is fast to prepare and will keep a stomach from growling. Here’s where scrambled eggs come in. 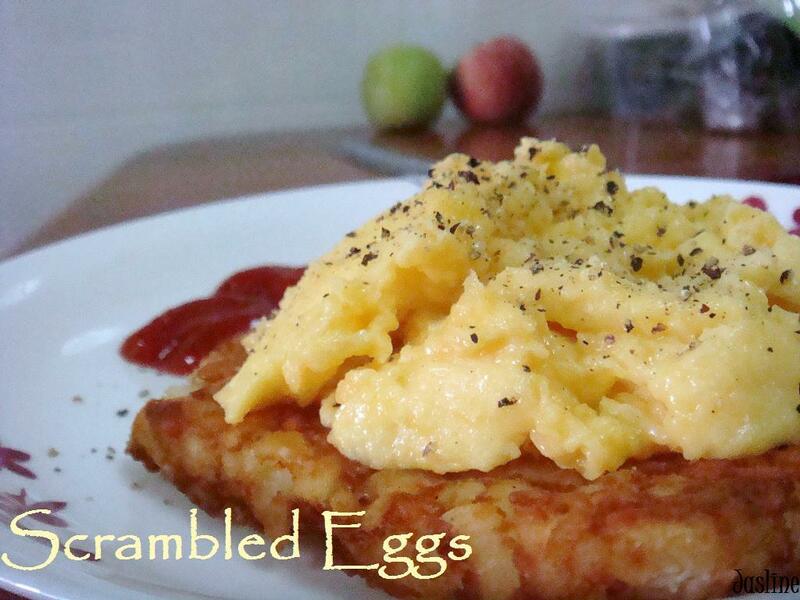 Smooth, creamy and melt-in-your-mouth scrambled eggs. I’ve always thought it’s difficult to prepare – but no, I am so wrong about that. I always try to have frozen hash browns on hand (I use Farmland), they are so easy to prepare and the best thing is that they don’t have to be defrosted before using them. I don’t like to put them in the oven – firstly you have to preheat the oven (equals to wasting time) plus they always stick onto the aluminium foil no matter how much I grease them (anybody has a solution for this?). So instead of using the oven, I stick to my another best friend – the non-stick frying pan. Heat a little oil, then in goes 2 pieces of hash brown – and while they are sizzling, I prepare the scrambled eggs.